I don't know if Kyle likes me doing this or not, but i am advertising another forum, that people who like cats would love to go on. 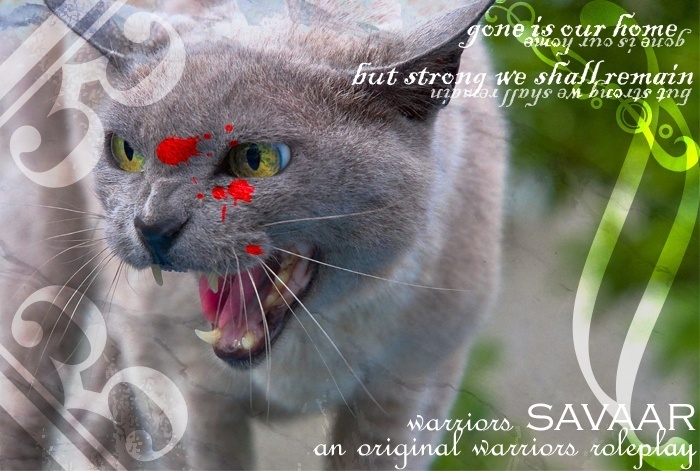 Savaar is an original warriors roleplay. It has been moons since the beloved Firestar joined StarClan. That was when it happened. They did it to the old forest, and now it was happening now. Two-legs were claiming the lake as their own. Cats fled, though some refused to leave. The ones that escaped and went away survived while the others parished. After many struggles the surviving cats split up into three groups. They came to a different forest, one that allowed them to thrive, but never like they had in their home around the lake. DuskClan, TorrentClan, and StoneClan came to be. But with peace comes danger. Welcome, to our forest, the forest of Savaar. You can make your on character, choose your own clan, and play games! Got a link? I can put it in the pic if you'd like. im not allowed to modify posts, so put it in the pic.